1 out of every 25 women we screen will be invited to an assessment clinic for further tests. This means that we have found an area on your scan that we would like to look at a little bit more closely. It does not mean that you definitely have breast cancer. We can use a few different types of test to check your breasts in more detail. You may need all of these tests or just one or two, depending on what the specialist wants to look at. Specialists will conduct a breast examination for most women at the assessment clinic. You will need to undress from the waist up for this exam. The specialist will look at your breasts and feel them for any noticeable changes. The specialist may also ask you some questions about your lifestyle and general health. All of the specialists at our assessment clinic are female. Ladies will often be taken for a second mammogram at the assessment clinic. This is to confirm that the first mammogram was accurate. A second mammogram also helps us to locate the exact area that we want to look at. Half of the women who come to the assessment clinic will need to have a biopsy taken. We will only take a biopsy if your other tests have not given us enough information. Only 1 in 4 women who we biopsy will be found to have cancer. A biopsy is where we take a small sample from your breast using a needle. The sample is then sent to our laboratory where specialists look at it under a microscope. This allows us to find minute changes within your cells. For a biopsy, you will need to undress from the waist up and lie on an examination couch. We will numb your breast for this procedure, so it should not cause any severe discomfort or pain. 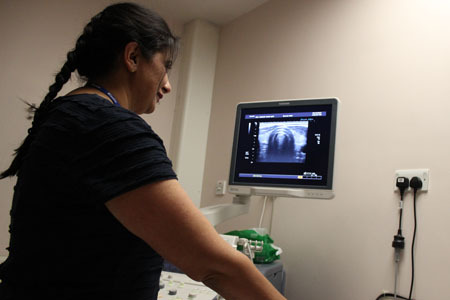 Ultrasound scans use harmless sound waves to look at your breasts. The test is done by moving a probe over the surface of your breast. You will need to undress from the waist up and lie on an examination couch for this test. Ultrasound scans are not uncomfortable or painful. Where are the assessment clinics based? Our assessment clinics are based at Castle Hill Hospital, Cottingham and Diana Princess of Wales Hospital, Grimsby. Appointments at the assessment clinic can sometimes take a long time, up to 2 hours. How long you will be at the clinic depends on which tests we need to do. The results of mammography, ultrasound and clinical examination will often be normal. If this is the case, the specialist will be able to discuss your results with you at your appointment. If we take a biopsy of your breast, you will need to wait a little while for the lab to look at the sample under a microscope. You will be booked in for a results appointment with the specialist 2-3 weeks following your tests. Half of the women we biopsy are found not to have cancer. Overall, 3 out of every 4 women who come to the assessment clinic are found not to have cancer. If the results of your extra tests show that you do have breast cancer, we will book you the next available appointment with a breast surgeon. You should not need to wait more than 2 weeks for this appointment. The breast surgeon will fully explain all of your test results and will talk to you about treatment. We will give you as much information as you want or need about your diagnosis and treatment options. You will meet with a Breast Care Nurse who will provide you with ongoing support and care. There are a number of organisations which provide extra support for women and men who have been diagnosed with cancer.